When Jenna Robey graduated from West Virginia University in 2012 and was ready to begin her career in the law profession she didn’t have to go too far from home. In fact, the Bridgeport High School graduate got her start just a couple of blocks away from where she earned her high school diploma. Robey began her career not long after graduating from WVU with Robert “Bob” Greer at Greer Law Offices on West Philadelphia Avenue. She worked there, where she eventually began practicing law, until this past December. Since then, she’s not given up practicing law. Instead, she’s started her own business. 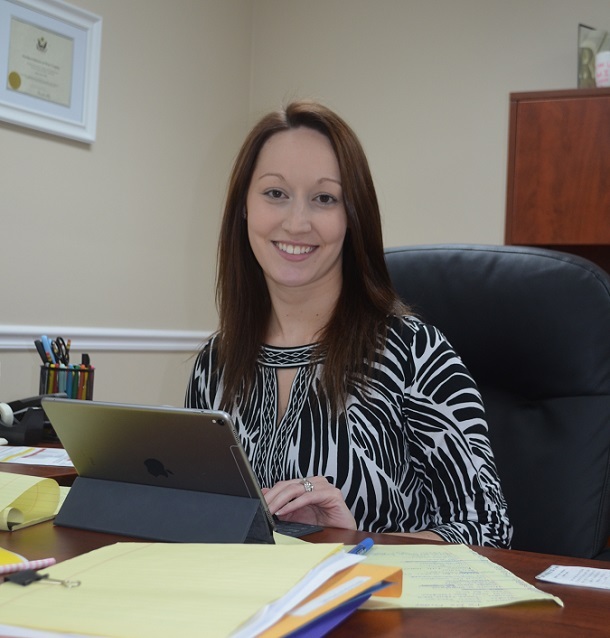 For the last few months, she’s running J Robey Law, PLLC out of her new office on East Main Street in downtown Bridgeport in the plaza beside Oliverio’s Ristorante. Robey had nothing but good things to say about her time with Greer. In fact, she said he went above and beyond to help get her started. After she returned to Greer Law she eventually began doing more than office work. The legal work helped get her ready for what she’s focusing on now. Robey said she handles family law issues, including abuse and neglect cases, and also does a lot of work with wills, trusts and focusing on probate law. Currently, Robey works by herself. Eventually, she said she may add clerical staff. For now, she’s flying solo. Jenna and her husband Matthew Robey are the parents of MaKenna, 5, and Dominic, 4 months. Robey’s address for business is 519 D East Main Street. She can be reached at 304-844-0036. Editor's Note: Pictured is Jenna Robey after her Main Street office.